Looking for a best Adobe Acrobat alternative which can handle all kinds of PDF tasks like converting your documents with higher accuracy, accessing and sharing files quicker, save time in finding your favorite tools, adding digital signature to your documents or getting documents signed faster, etc. Nitro Productivity Suite is the one and only solution for all your PDF productivity needs. So let's explore more and get into more depth review given below. But before we move forward let me inform you that the contents of this website are updated frequently, so don't forget to subscribe to my email list to get more useful tips of this blog in your Email. Nitro Productivity Suite is the #1 Adobe Acrobat alternative which can lower your cost and frustration. It comes with Nitro Pro 12 Edition which helps you to get PDF productivity at an Enterprise Scale. With it's Nitro Cloud, you can easily get your documents e-Signed faster without any paper. You can also see ROI with Nitro Analytics like feature usage, printing activity reports, etc. This is available for Enterprise users. So in short you get all features of Nitro Pro 12 and Nitro Cloud under a single product introduced as Nitro Productivity Suite. Nitro Pro 12 is an amazing PDF productivity tool which will help you to Create and Merge, Convert & Export, Edit & OCR, Review & Collaborate, Fill, Sign & Secure your PDF documents. Get 20% Off on Nitro Pro 12. - It converts your documents with greater accuracy. - It access and share your files easier and quicker. - It gets your documents signed faster. - You can add your own digital signatures. - You can save time by finding your favorite tools. - It does easy transition from document creation to signing workflows. - It skips printing tasks by using digital workflows by leveraging print alternatives. - It saves money as it the no. 1 alternative to Adobe Acrobat. 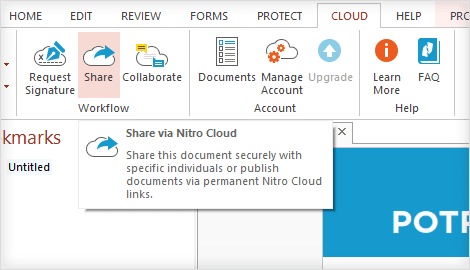 If you want to sign and certify documents by keeping all your confidential information safe and secure, then Nitro Cloud is the perfect tool for you. It is the popular digital signature solution which speeds up your workflows and derives insights from your documents and data you share with your clients. Cloud Storage integration across all popular platforms such as Google Drive, Dropbox, OneDrive, etc makes this a perfect choice for users who are looking to work from any part of the world. You can create 100% industry standard PDFs which are compatible with Adobe Acrobat and it can be viewed on any devices. - Finalize PDFs, reorganize pages and set form fields in any web browser before sharing. - No need to print and sign forms like POs, expense reports and offer letters. - It expedites your form filling and signing process on any device. - You can transfer your documents from Desktop to Cloud securely. - It provides a better signature experience for your clients and employees. - Access your stored documents from popular cloud storage solutions such as Dropbox, Google Drive, Box and One Drive. - You can use suggested print alternatives to reduce paper cost. 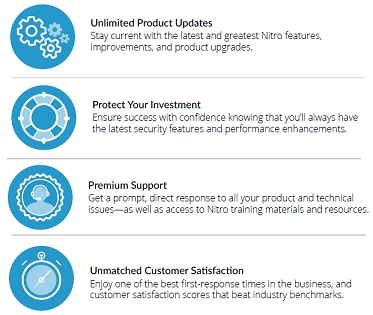 Nitro VIP Access formerly known as Software Assurance is an annual subscription to get most out of your Nitro investment with premium 24/7 support, unlimited product updates and many more benefits. Nitro VIP access is included in all subscriptions plans such as Nitro Productivity Suite, Nitro Pro 12 and it is available as a 12- month subscription based on per individual perpetual license. You get lifetime Premium Support with a first-response time of 4 hours through email for Business Plan customer. Enterprise plan customers enjoys 2-hours first response time for emails. You can buy Nitro Productivity Suite now from the official store of GoNitro. So place your orders now and start enjoying the new PDF tools to increase productivity of your organization. So here I conclude with Nitro Productivity Suite review that it is the best solution for organizations who are looking for a robust PDF productivity tool and wanted to save cost on a PDF tool. It is the no. 1 alternative to Adobe Acrobat. Do let me know through comments if this review has helped you. Don't forget to subscribe to my email list to get more useful tips of this blog in your Email. If this review has helped you do give us a Facebook like below. I would also request you to share this review with your friends, colleagues, your employees or your boss at your current organization from the social network buttons given below.